Shortstuff has a challenge to overcome. He wants to be a rodeo bucking horse, but he is too SHORT! Listen as he shares his story of success with Cowgirl Peg's horses. Learn how he overcame his disadvantage. Told by the horses and containing a great life lesson, this story will entertain young readers with humor, suspense and beautiful artwork. Now available in Perfect Bound Softcover. Checks and money orders can also be sent to the address om the contact page. 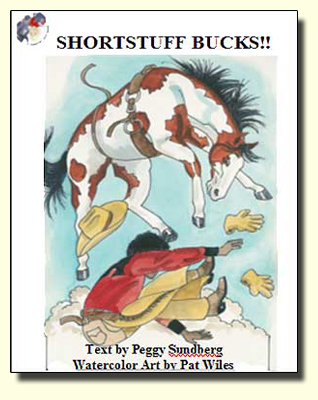 ShortStuff will also be available at Amazon.com and Barnes & Noble as well as other retail outlets.